Latest technology - As heard on Radio Australia wide and seen on TV. Pestrol Ultra Automatic Pyrethrum Spray Unit is a continuous automatic aerosol insect killer containing natural pyrethrum. Safe around the family and pets. You can even leave your doors and windows open. Highly effective pest control for your home or office. Order your Pestol Ultra Automatic Pyrethrum Spray Unit today. The Pestrol Ultra Automatic Pyrethrum Spray Unit is fully programmable and is powered by 2 high quality alkaline AA batteries that are included. This unit releases a micro mist amount of pyrethrum into the atmosphere every 5, 10, or 15 minutes, which travels through the interior by air movement. Pestrol Ultra Pyrethrum Refill Cans are available in quantities of 1, 2, 4, 6, 12, & 24. There is a 12 month warranty on Pestrol Ultra Automatic Pyrethrum Spray Unit. 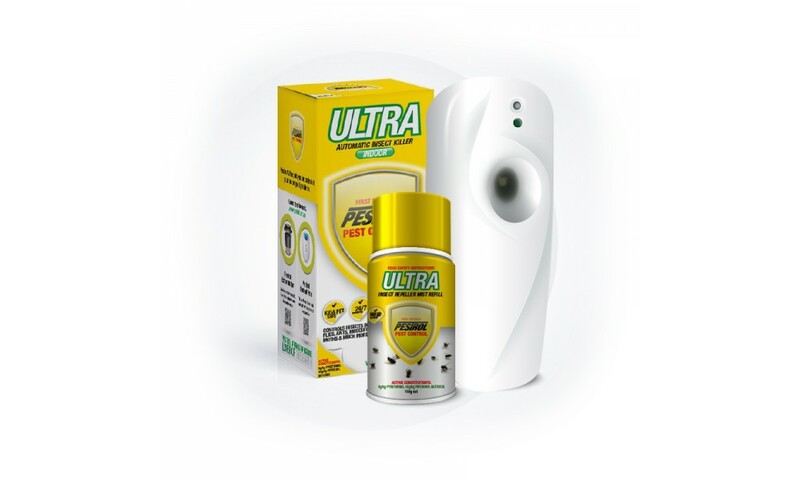 The key to Pestol Ultra Automatic Pyrethrum Spray Unit is the precise electronic dispenser equipped with a computerised electronic system that creates a special micro mist, enabling pyrethrum spray to move throughout the entire home. Government Health Authorities are cracking down on food businesses and there is a need to take all practicable means to prevent public health pests such as flies, fruit flies, cockroaches & ants. Pestrol Ultra Automatic Pyrethrum Spray Unit's technology which includes natural pyrethrum spray formulation provides an effective and environmentally friendly pest management system. 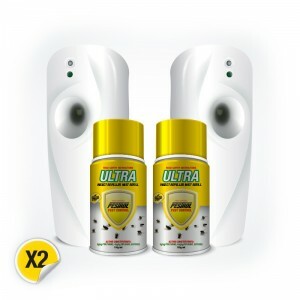 Effective on all insects including flies, mosquitoes, fleas, ants, cockroaches, moths, silverfish, borer (in flight), dust-mites. The pyrethrum spray naturally repels and kills insects. Only one Pestrol Ultra Automatic Pyrethrum Spray Unit is all that is required for a typical home (150m2). It's so easy to use. Place it on a shelf or on the wall bracket provided, switch on. The Pestrol Ultra Automatic Pyrethrum Spray Unit will then mist automatically on your desired timed settings. Fully programmable you are in the driving set. Day / Night setting options - enables you to prolong your Pestrol Ultra Pyrethrum Refill use. Battery operated. Fully portable, take it anywhere. Pyrethrum is derived from the Chrysanthemum daisy flower. Safe for people and your pets . They quickly bio-degrade in sunlight and leave no residues. Ozone safe. The price includes the Pestrol Ultra Automatic Pyrethrum Spray Unit and the first Pestrol Ultra Pyrethrum Refill Can which will last about 6 weeks. 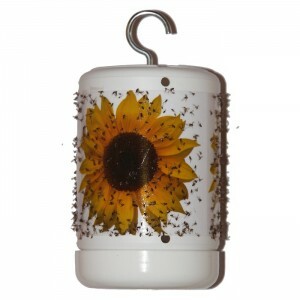 Economical replacement pyrethrum cans are always available. Being fully programmable means you set the unit to the timed setting that best suits your home. Prolonging the life of the Pestrol Ultra Pyrethrum Refill Cans. Switch the unit on and off at your own discretion. Fully programmable Day or night time settings. 24 hour operation - 5, 10, 15 minute settings. Clean and efficient operation - does not drip or leave any residue. One Pestrol Ultra Pyrethrum Refill Can will last approximately 4-6 weeks. Most users will use approximately 4-6 cans a year. Often using the unit - spring through autumn. The reason for this units recent success has been the ability to easily adjust the units timing mechanism. This prolongs the use of the refill cans and puts you more in control. The unit can be turned on and off at your discretion. 2 x AA Alkaline Batteries included. 1 x Pestrol Ultra Pyrethrum Refill Can included to make a complete unit ready to go. Pestrol Ultra Automatic Pyrethrum Spray Unit can work with the doors and windows open. Pestrol Ultra Automatic Pyrethrum Spray Unit is best placed in the main living areas where greatest concentration of insects would be. May require 2 units for multi-level homes. Most effective 2 metres above the ground. Can either be attached to the wall or just sit on a shelf. Contains Natural Pyrethrum. Other units on the market can and do contain cheaper synthetic pyrethroids and other chemicals. Pestrol Ultra Automatic Pyrethrum Spray Unit has been installed in many restaurants / Aged - day care centres / commercial and most popular in residential dwellings Australia wide. Many customers purchase extra Pestrol Ultra Pyrethrum Refill Cans with their initial purchase to save on delivery charges in the future. To open the dispenser place the key in the hexagonal aperture on the right hand side of the unit. Turn the key around anti clockwise and then pull out the locking plug. To attach to the wall use the screws provided. If required use the plastic mounting plugs when placing on wall board or concrete. Select a position about 2 metres from the floor and not closer to 300 mm from the ceiling. Do not spray over white wear, polished furniture, painted surfaces or wallpaper. When loading a new Pestrol Ultra Pyrethrum Refill Can, push the arm upwards so as to make room for the dispenser valve. Note the Pestrol Ultra Pyrethrum Refill Can rim fits over the top of the metal bracket. Set the timer on 5 or 10 minutes and the operation to 24 hours for normal operations, or day or night as required. The setting will depend on conditions and the number of insects about, and the time of year. Switch the power switch to on. The dispenser is equipped with a timer that will set off a flashing red light after 6000 shots, warning it is almost time to change the Pestrol Ultra Pyrethrum Refill Can. Note cans generally contain well in excess of 6000 shots. The timer is reset by simply turning off the ON /OFF switch on the dispenser. Close cover and re-lock the unit by re inserting lock and turning clockwise. Make sure the dispenser valve is lined up in the middle of the spraying Aperture. An electronic head automatically dispenses pestrol into the air every 5 minutes. It is powered by a small 9 volt battery included lasting up to 12 months or with a Alkaline battery up to 18 months. It dispenses a minute amount of Pestrol into the air which travels throughout your interior by air movement. Pestrol either repels insects or if they stay they die. One Pestrol Ultra Automatic Pyrethrum Spray Unit will take care of a average home of 150 M2 or 1500 sq ft. Additional Pestrol Ultra Automatic Pyrethrum Spray Units may be required for larger dwellings. Pestrol Ultra Automatic Pyrethrum Spray Units also can help disturb insects from their hiding places. 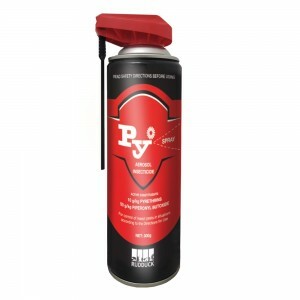 Pestrol Ultra Automatic Pyrethrum Spray Unit can be used with your doors and windows open. Simply place Pestrol Ultra Automatic Pyrethrum Spray Unit on a shelf or wall bracket, push the button to set and forget. It will then send a micro mist into the atmosphere every 5 minutes. Place your Pestrol until in a central location at a height of approximately 2 metres above the floor, and at least 300mm from the ceiling. Pestrol vaporises instantly into the air because of the ultra fine mist dispensed by the electronic head. Pestrol molecules move through the home or work place, into the cupboards, wardrobes and behind furniture. Performance may be affected by excessive internal air flow. Yes! Pestrol Ultra Automatic Pyrethrum Spray Unit is extremely cost effective insect control system by comparison to other house sprays. The price includes the Pestrol Ultra Automatic Pyrethrum Spray Unit, a wall bracket and your first refill which will last approximately 6 weeks if used continously. Refills are always available. The Pestrol Ultra Automatic Pyrethrum Spray Unit comes with a 1 year warranty. When you first start using Pestrol Ultra Automatic Pyrethrum Spray Unit, Ants Flies and Mosquitoes may take up to a day and other insects may take a longer period before it starts to work. Spiders tend to leave as there is no insects for them to eat. Is it like other sprays? No! The Pestrol formula is designed to mist and evaporate staying in the air. It dispenses the same amount of material in 2.5 days as one 7 second burst of typical fly spray. The droplet size produced is almost molecular. What insects will it repel? 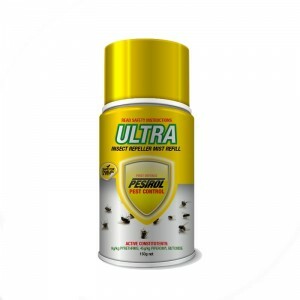 Pestrol Ultra Automatic Pyrethrum Spray Unit eliminates Ants, Flies, Mosquitoes, Cockroaches, Silverfish, Fleas, Borer in flight, Dust Mites and all other insects. Pestrol Ultra Automatic Pyrethrum Spray Unit works extremely well around the home, offices, restaurants, shops, bakeries, bars, and any other indoor places where people are. Keep the can away from fire or direct sunlight. Keep it out of reach off small children as it may be harmful if taken internally. Do not place it on or above white ware. Can you turn the units on and off? Yes, you can control the Pestrol Ultra Automatic Pyrethrum Spray Unit. In cooler months you can turn the unit off to save the refill contents.